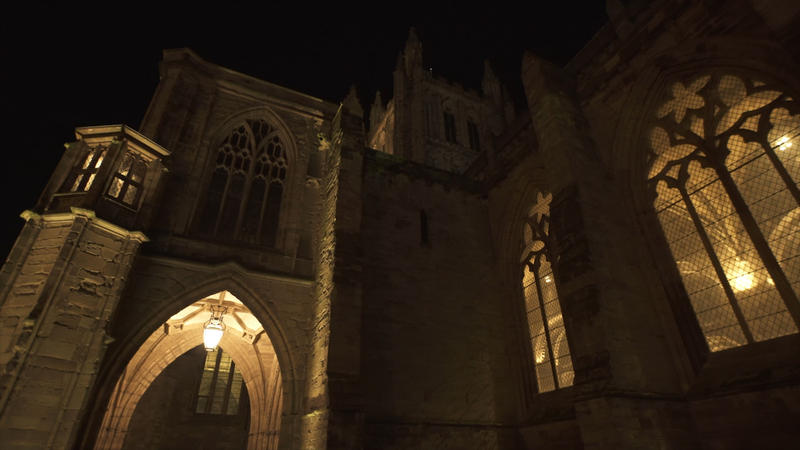 Located near the Welsh border on the River Wye, England’s Hereford Cathedral has drawn worshippers since the end of the 7th Century. The present-day structure was rebuilt in the 1100s and is considered one of the UK’s finest examples of Norman cathedral architecture. But what makes this place of worship so unique is the fact that it’s managed to hold onto many of its ancient treasures throughout the centuries. The cathedral boasts the largest surviving chained library in the world. It also has one of the only surviving copies of the 1217 Magna Carta. Its most impressive artefact, however, is the Mappa Mundi: one of the oldest, largest and most curious medieval maps in the world. Meaning ‘atlas’ or ‘sheet of the world’ in Latin, the Mappa Mundi is an incredibly detailed 1.59m-long by 1.34m-wide map depicting the history, geography and religious understanding of the known world from the point of view of 13th-Century European scholars. The map was believed to be created around 1300 and features more than 500 ink drawings on a single sheet of calf skin, offering a fascinating glimpse into the mindset of the ancient Christian world. The map is listed on Unesco’s Memory of the World Register and described as ‘the only complete example of a large medieval world map intended for public display’. In many ways, it serves as a sort of visual encyclopaedia of the period, with drawings inspired by Biblical times through the Middle Ages. In addition to illustrating events marking the history of humankind and 420 cities and geographical features, the map shows plants, animals, birds and strange or unknown creatures, and people – all of which helps to shed light on what Christians both did and didn’t understand about humanity at the dawn of the Renaissance. In medieval times, there were hundreds of illustrated Mappa Mundi, but the one displayed at Hereford is the largest to have survived intact. At first glance, the world depicted in the Mappa Mundi is unfamiliar. That’s because, despite its traceable pilgrim and trade routes, scholars widely agree that it wasn’t intended as a geographic map. The shapes of the seas and continents are different than other maps and mislabelled. Instead, the map was meant to serve as a compendium of the world’s knowledge from a spiritual and earthly perspective. In keeping with how most 13th-Century European Christians viewed the universe, the Mappa Mundi places Jerusalem at its centre. Only three continents – Europe, Asia and parts of North Africa – represent the inhabited part of the known world. Europe and Asia’s labels are reversed. The Red Sea is depicted in red ink, oceans are green and rivers are blue. Asia and the East, where the sun rises and where medieval Christians looked for the second coming of Christ, is placed at the top. Paris and Rome are among the largest cities depicted on the map, while Hereford is a tiny, indistinct dot that has nearly rubbed off the calf-skin sheet. In addition to illustrating people and places, the map also shows supernatural scenes from classical Greek and Roman mythology, Biblical tales and a collection of popular legends and stories. Look near the Strait of Gibraltar and you’ll see the Columns of Hercules, which were thought to mark the end of the inhabited world. The earthly paradise of Eden is represented by a circular island at the eastern extreme of the world, near Asia. Some of the most important Old Testament stories, such as that of Adam and Eve, Noah’s Ark and the Tower of Babel, are rendered on the top-right of the map. From Greek mythology, the Cretan labyrinth built by Daedalus to contain the Minotaur is shown, as is the myth of Jason and the Golden Fleece. Separately, there are also references to the stories of Alexander the Great. Historian and cathedral librarian Rosemary Firman believes that the map was intended to be seen by pilgrims visiting the shrine of St Thomas Cantilupe, who was buried at Hereford Cathedral. Since many pilgrims in the 13th and 14th Centuries would not have been able to read, the map could simply be enjoyed as an aesthetic piece of art by those who knew little of classical mythology and also as a kind of visual encyclopaedia for those who were more educated. A collection of curious bestiaries, monstrous races and outlandish creatures from far-off lands also populate the Mappa Mundi. A ‘Blemmye’ – a war-like creature with no head, but with facial features in its chest, clutches a spear and shield in Africa. Two ‘Sciapods’ (men with one large foot) are shown: one in India, and another on the southern edge of the circular map. And four cave-dwelling Troglodites are illustrated – one eating a snake. Many of these strange beasts are mentioned in ancient Roman texts, like Pliny the Elder’s Natural History. Today, many scholars, including medieval art historian Marcia Kupfer, think it’s unlikely that the map’s designers ever travelled to any of the places depicted on the Mappa Mundi. Instead, much like the depicted Biblical and mythological stories, Kupfer thinks it is more probable that these monstrous creatures were simply illustrations of popular stories passed down through the Middle Ages that, as she put it, “represented the wondrousness of God’s creation”. The Hereford Mappa Mundi is undoubtedly based on a Christian and English perspective. Christ judges mankind from the apex of the piece, and a recent examination by University of Glasgow senior lecturer Debra Higgs Strickland reveals examples of anti-Semitism – which is rather unsurprising, considering the map was created around the era when Jews were expelled from England by King Edward in 1290. In a scene depicting the story of Exodus, four Jews are seen worshipping at an altar where the golden calf is shown as a demonic idol defecating. The Jews are labelled ‘Judei’ in red lettering, and Strickland argues that the only Jewish figure whose face is clearly seen is a stereotypical caricature, with “particular significance assigned to exaggerated, elongated, broad or hooked noses and beards”. In another scene, Moses is illustrated receiving the Ten Commandments and is depicted with yellow horns. According to Strickland, the map presents a prejudiced view of non-Christians that was typical of the time and manifests in many other works of art in England and elsewhere, although to include such references on a map of the world was quite rare. Today, the map’s makers remain unknown, yet it’s widely agreed that the work was created by a small team of designers as opposed to a single artist. Since the handwriting in the map is consistent, Firman and other scholars believe it was labelled by one scribe, while two or three artists may have drawn the illustrations. 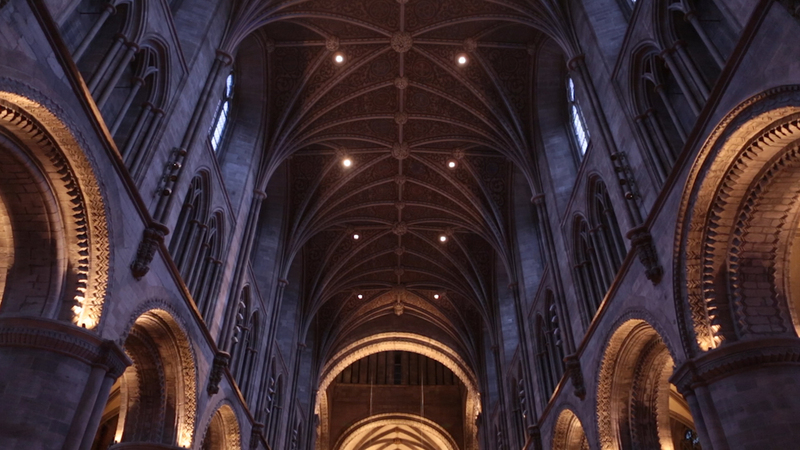 It’s also a mystery how the Mappa Mundi actually came to be at Hereford Cathedral (pictured). 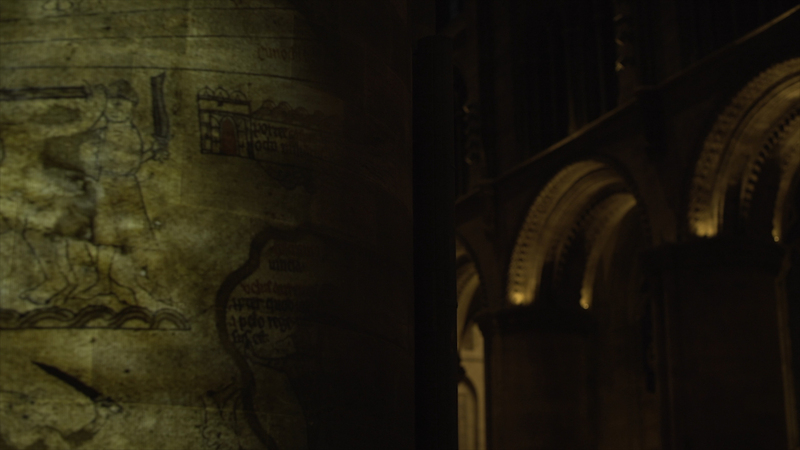 Some scholars believe it may have been created in Hereford, but small clues link it to Lincoln Cathedral in the East Midlands, where the map’s commissioner, Richard of Haldingham, is believed to have worked. The city of Lincoln and its cathedral are also depicted in vivid detail on the map, while Hereford appears to have been added near the River Wye almost as an afterthought. New theories about Hereford’s map continue to develop and divide scholars and historians. Kupfer argues that there are two perspectives of the world rendered within the map: one showing a humanistic and mortal vision, and another showing a divine perspective. For centuries, scholars thought the map’s calligrapher had incorrectly labelled the continents of Asia and Europe, but Kupfer believes this was an intentional ‘artistic invention’ and one of many examples of mirrored imagery within the map. According to Kupfer, our human vision of the world is portrayed correctly, while God’s vision is reflected in a mirrored and reversed position. Another theory, according to Firman, is that the cities, people and animals found within the map’s circle reflect earthly matters that are bound to the constraints of time; while certain Biblical scenes placed outside of the Earth’s circle – such as Christ’s Last Judgment – are timeless. Historian Sarah Arrowsmith says the Mappa Mundi would have been awe-inspiring to the average visitor during the Middle Ages. Kept behind two wooden doors, the map was concealed during much of the year and only displayed to the public during special days and events. Hereford Cathedral’s Reverend Canon Chris Pullin maintains that the Mappa Mundi would have been the first depiction of the entire world many medieval people would have ever seen. And in an age rife with symbolism and rituals – from the clothing people wore to religious and civil ceremonies – the map likely would have helped people find meaning and hope in their lives. While the Mappa Mundi may be Hereford Cathedral’s most significant medieval artefact, it isn’t its only one. Tucked away in a wing of the cathedral is the largest surviving chained library, where 229 ancient texts and manuscripts are still kept under lock and key in their original chains. Books were rare and valuable assets in the medieval world, and so beginning in the Middle Ages, universities and cathedrals around Europe began tethering them to a shelf with a chain to safeguard the works. Today, the library and its chained contents are still open to the public. The cathedral also boasts a copy of the Magna Carta. Often considered the foundation of English law and the first document limiting the King of England’s powers and protecting civil rights, the document’s most significant revision was issued by Henry III in 1217. Only four of the original charters survive, and one is kept on display in the library of Hereford Cathedral. More than 700 years after the Mappa Mundi’s creation, tens of thousands of visitors continue to marvel at this fascinating glimpse into medieval life every year. Centuries of candlelight and finger-pointing have discoloured the map, but in 2013, Hereford Cathedral’s Mappa Mundi Trust commissioned the first high-resolution 3D scan of the ancient manuscript. Today, those who are unable to visit Hereford can view the map online in an interactive gallery that explores its many myths, beasts and cities in vivid detail. Those who can visit are treated to one of the UK’s best-kept medieval secrets; a world where mysterious oddities and mythical curiosities never fail to inspire wonder.